The pictures of the Sony Walkman in this BBC Magazine article made me feel strangely nostalgic – the actual text of the article made me laugh out loud. 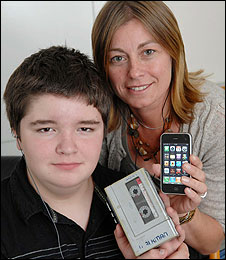 The Magazine invited 13-year-old Scott Campbell to trade his iPod for a Walkman for a week, and he recounts his experiences with the device, which was launched 30 years ago this week. Campbell, apart from being amazed at the blandly colored portable music player, correctly points out that the Walkman is much bigger, heavier and generally more clunky than the digital media players he’s accustomed to seeing within his social circle. On the upside, he writes, the ‘monstrous box’ comes with a ‘handy belt clip screwed on to the back’. Update: ha, Campbell is one of our interns at CrunchGear! Campbell goes on to speak wise words (“portable music is better than no music”) and lists the pros and cons of the portable cassette player compared to its latter-day successor. Go read it here. Anyone else felt a bit nostalgic about the good old cassette tape after reading?